Sandy Brady of Reidsville, N.C., has been bitten by an incurable bug over the past couple of years: the sling-bow bug. 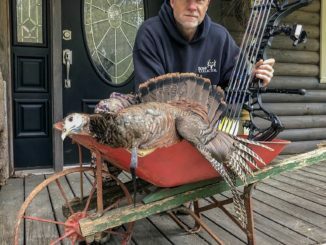 Dusty Anders of Deville was excited when he called an outdoor writer in early February. 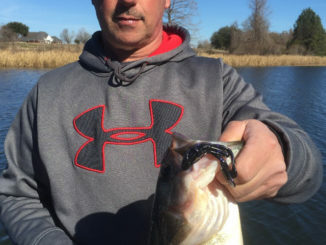 The 50-year-old firefighter, an avid bass angler and part-time fishing guide, had just boated an 8-pound bass on one of his favorite new soft plastics. 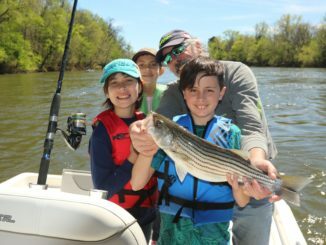 The N.C. Wildlife Resources Commission will extend the striped bass harvest season within the Roanoke River Management Area until midnight on Sunday, May 6. The season had been set to expire by rule on April 30. Read the proclamation here. 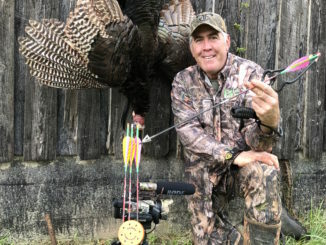 For the average turkey hunter, a bearded hen is something you don’t see everyday — one with a beard long enough to rival a full-grown gobbler is pretty darn rare. Shoot it with a bow and arrow and you’ve got a real anomaly. 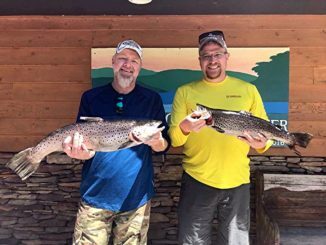 Billy Lewis of Liberty, S.C. knew the trout fishing on Lake Jocassee would be good during the latter part of April. 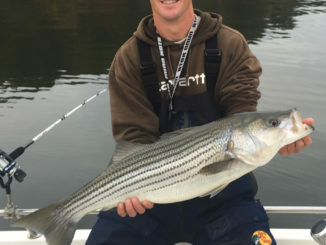 On previous trips the weeks before, he started dialing in on a good pattern trolling flutter spoons from downrigger balls behind his pontoon boat and had already caught a couple of limits. 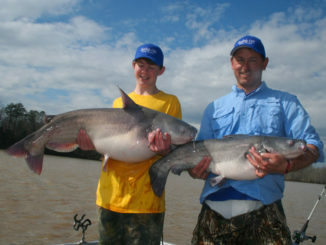 Guide Rodger Taylor of Rock Hill, S.C., said that catching blue catfish on Lake Wylie this month can be great, but you need to be flexible. 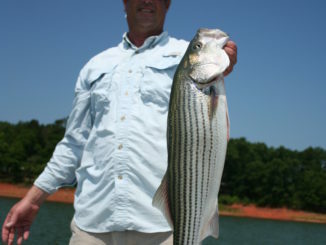 Guide Colt Bass of Collettesville, N.C., said May is a productive month for quality stripers at Lake Hickory on the Catawba River system. 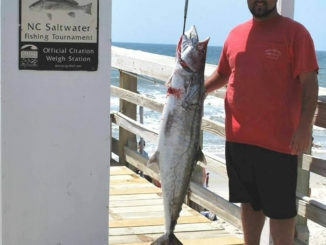 One of the high points of spring fishing is the annual run of king mackerel along North Carolina’s southern beaches. Kings migrate up the beach and take up residence for anywhere from a few days to a few weeks between the ends of fishing piers and nearshore artificial reefs. During exceptionally warm springs, it may begin in late April, but it has usually fired off by mid-May. 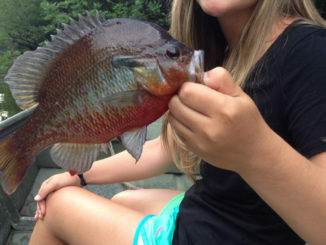 This time of year, it’s tough to beat fishing in the blackwater swamps for redbreast sunfish. These brightly-colored cousins of the bluegill are spawning, so their colors are brilliant, they are hearty eaters and strong fighters, especially on ultralight tackle. 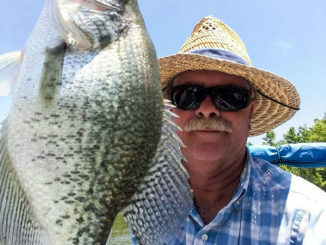 Although most crappie fishermen regard early spring and the prespawn period to be the best fishing of the year, guide Chris Bullock of Fountain, N.C., holds May in high esteem for sheer numbers of fish and the pleasure of using a unique approach. 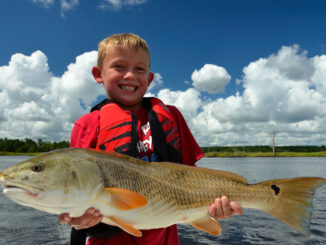 By May, spring fishing is going full bore inshore and offshore, and that includes fishermen who barely think about anything except redfish. Preston Harden admits right off the bat that he might be biased.